Published in 2005, the original CSIRO Total Wellbeing Diet book converted clinical research results into a worldwide best-seller. CSIRO conducted several of the largest studies showing that higher protein dietary patterns for weight management have metabolic advantages over high carbohydrate patterns in overweight people. The results clearly showed health benefits and significant weight loss from a diet higher in proteins and low in fats and the ‘Total Wellbeing Diet’ was born. After many requests for further information it was decided to publish the Total Wellbeing Diet. In 2006 Book 2 was published, expanding on the information provided in the original book and introducing a simple exercise program. The Total Wellbeing Diet has directly influenced dieting practices of thousands of individual Australians. It also directly influenced debate among dieticians and others on the balance of protein, carbohydrate and fat, necessary for effective dieting. The original CSIRO Total Wellbeing Diet book has sold over 700 000 copies. 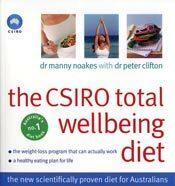 The CSIRO Total Wellbeing Diet research team, led by Manny Noakes and Peter Clifton, received a CSIRO Research Achievement Medal in 2005. In the same year the CSIRO Total Wellbeing Diet Book team received the CSIRO Medal for Business Excellence for their work in publishing the CSIRO Total Wellbeing Diet book. The CSIRO Total Wellbeing Diet book cover.